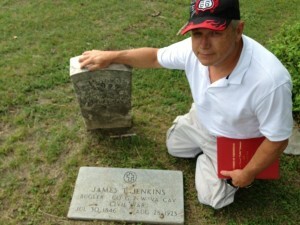 Eddie Phillips visits the grave of his great-great-grandfather, James Taylor Jenkins, in Pleasant Mound Cemetery, Dallas County, Texas. As part of the ongoing effort to document the grave locations of soldiers of the 7th West Virginia Cavalry, descendant Eddie Phillips recently shared a photo of his visit to his ancestor’s grave in Dallas County, Texas. James Taylor Jenkins was a bugler in Company G.
James Taylor Jenkins grave at Find A Grave…. This is a “work in progress.” Many grave locations will be added and linked to Find A Grave over the next few months. If you have information on the grave location of a 7th West Virginia Cavalry soldier, please share using the Contact Form. Thanks.